Welcome to the Sorbetto Sewalong! I am so glad you are joining us for the Sorbetto Sewalong! Together, we will make all three versions of this lovely top. If you don’t have your own copy of the pattern yet, you can download it in the Colette Patterns shop—it’s free! This Sewalong will be co-taught by myself (Haley) and my pal and fellow sewing expert, Katie. I am a professional sewing teacher, writer, and the Editorial Director over at Colette HQ. I have years of experience in women’s ready-to-wear, teaching, and home sewing. As Producer at Colette HQ, Katie teaches new skills through in-depth tutorials, Sewalongs, and articles for Seamwork Magazine and the Colette Blog. We can’t wait to make all three versions of Sorbetto with you! Our Sewalongs are simple. We’ll publish a series of posts detailing each step in the process of fitting and sewing the pattern. You can sew along with us, ask questions, and share your techniques and advice with others. Feel free to leave comments with thoughts, questions, and photos. We try our best to answer as many questions as possible, but encourage you to jump in and help each other out as well. We’ll start this week with a discussion of fabric and supplies. Then we will dive into fitting, so you can get a completely custom-fitted Sorbetto. The focus on fit makes this Sewalong a little different from the rest. We will divide our fitting into two sections: pre-muslin fit adjustments, and post-muslin fit adjustments. Pre-muslin fit adjustments are changes made to a pattern based on simple measurements alone. They help minimize the work to be done once the muslin is sewn. After our muslins are created, we’ll dive into some additional adjustments to help you achieve the perfect fit. After thoroughly fitting Sorbetto, we will construct this simple top, from cutting to hemming. And finally we will share our Sorbettos. Hi – This is the first pattern I’ve downloaded. I’m wondering about printing the pattern. The zip folder included “wide” and “a0” versions. Could you please explain what these are? Thanks! Great question. If you don’t want to print your pattern at home, both the wide and A0 versions can be taken to a local copy shop and printed on a large piece of paper. Here in the US, copy shops use the wide format, but many countries outside of the US use A0 sizing. The wide format prints on a long roll of paper, while the A0 format prints on sheets of A0-sized paper. Did I miss the fabric (amount) requirements? Hi Asa. You can find the fabric requirements in the pattern instructions (on page 11) or on the website here if you click the “details” tab. Hope this helps! I have an unusual body shape and size: petite but with 36K bust and 37″ waist. How do I even begin to select the right size? Hi Kathy, I can help you select a starting size. We will be covering quite a few fit adjustments in this sewalong, including bust adjustments. Chances are, you will require some customization to get a perfect fit. What are your bust, upper bust, waist, and hip measurements? Are stitching margins included? Or should they be added? A 5/8″ seam allowance is included in the pattern. Hello Haley – I see the staystiching is calling for a 1/4 seam allowance. Maybe I’m missing it but I don’t see the 5/8″ seam allowance anywhere in the instructions. Am I missing it? Coming from the quilting world, 5/8″ seems incredibly big! Hi Rebecca, the seam allowance width is noted on page 21 of the pattern instructions. You will use this seam allowance to assemble the top (shoulder seams and side seams). 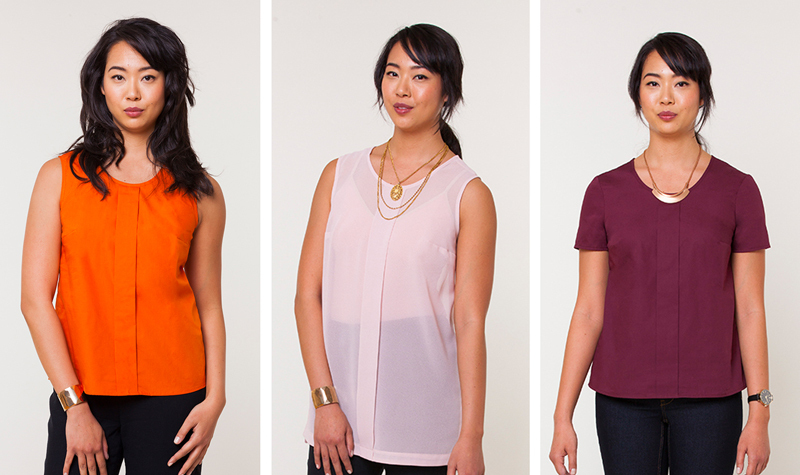 The 1/4″ stay stitching is just for the neckline on all versions and armholes on versions 1 and 2. There is a size chart in the Details, but then when you click on “Size Guides” in the Basic Info page, it takes you to a general Colette sizing chart, mentions they all use a C cup….a bit confusing. Hi everyone! Joining late, but reading along great! I am an amateur sewist for 3 years now, and am looking to refine my craft! Looking forward to making this one! Welcome to the sewalong, Annie! Glad you are joining us! Do I need the new pattern? My old Sorbet to fits great! The construction for version 1 is very similar to the old version of Sorbetto, so you could follow along using the old version if you prefer! I am getting ready to take my pattern to the printer to get copied. The ‘what’s included’ page in the instructions lists versions 1, 2 and 3 as being 18 – 16 wide. Is that supposed to be 18 – 26? I want to print all three versions in the 18 – 26 sizes, and am in the US. What files do I take them? Thanks. That was supposed to read 18-26. I have passed this issue on to the team, for immediate correction. The file you would want to bring for wide format printing would be the files labeled wide. The rest depends on which size range and version you would like to print. Sew excited to be here! Trying to catch up and need a crosscheck on my printing procedures. I want to make the one with sleeves, am printing at home on US-standard 8.5*11 paper, and am plus size, so printed the first page of the 10-colette-0003-sorbetto-sizes-18-26v3.pdf file and measured the test square. It came out about a quarter inch wide in each direction. If anything I would have thought the square would shrink because the printer app seems to have added margins. Does that square run large or do I need to do a scale correction to .94 or use a different file? Whoops, I meant a quarter inch *too* wide! Hi Avrila, check out this post on scaling patterns. Thanks for following along! I’ve noticed that when I assemble the PDF pattern, aligning the pattern lines and the diamond marks, the outside rectangular box is out by 1mm on the bottom line. Anyone else seeing this issue? Is there any difference in the body between v1 and v3–do the armholes change for the sleeved version? Version 1 and 2 have the same armhole shape. Version 3 has a different armhole shape due to the sleeves.